Postcard US-3934052 to France shows the Seven Caves of La Jolla, near San Diego, California. Nestled between La Jolla Cove and La Jolla Shores, only one of caves is accessible by land while the other six can only be accessed by guided kayaking. Housed in a seventy-five million year old sea cliff, each of them has a unique name: White Lady, Little Sister, Shopping Cart, Sea Surprize, Arch Cave, Sunny Jim’s Cave, and Clam’s Cave. Sunny Jim’s Cave, named after a cartoon character from a brand of cereal that was common at the turn of the century because of the similarity of the shape of their mouths, is the only known land accessed cave along the California coastline. 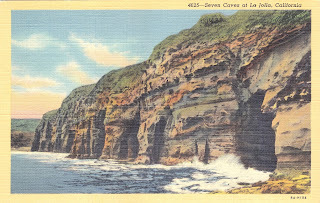 In history, the cave's tunnel, leading to Coast Boulevard in La Jolla, was carved out by Chinese immigrant laborers for smuggling Chinese and other immigrants into the United States. Those intriguing caves were also once used to smuggle illegal whisky during the prohibition from 1920 to 1933. Peach Aviation Unveils "SAMURAI Aircraft"